"I never took the Kobayashi Maru test, until now..."
In the climactic scene of Star Trek II: The Wrath of Khan, the crew of the Enterprise is faced with a no-win scenario, and Spock chooses to sacrifice himself to save his comrades. While the decision is heart-wrenching for his human friends, Spock merely sees his duty before him and performs it without hesitation. 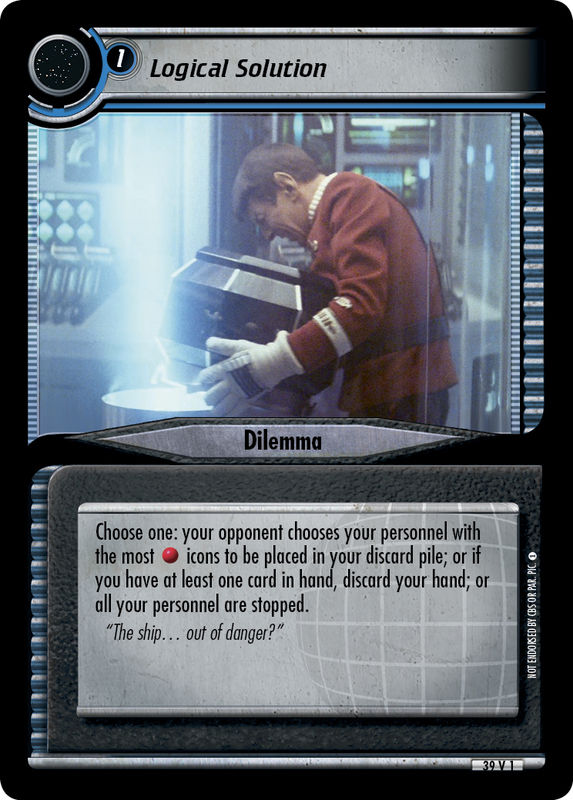 For the 50th Anniversary set, we wanted to create a dilemma that forced a player to make the same sort of difficult choice, where the sacrifice of one could potentially salvage a mission attempt that would otherwise fail. The original pitch was to either sacrifice the personnel with the most different skills, or to stop all your personnel. Playtesters universally reported that the second option was never chosen, and that it was essentially a guaranteed filter. It also originally functioned as a "skill dilemma" to keep it safe from the likes of Donatra and Reyga, and it even had a no interrupt/no skill gain clause to effectively immunize it against any other "prevent and overcome" shenanigans; a true no-win scenario. After a few cycles, it became clear that the card was trying to do too much, and that its intended function was a bit far-reaching. We stripped it down to its core idea, and it became cheap enough to grab with Uninvited, which was a major win with testers. The last major change was adding its third mode to allow discarding your hand of at least 1 card; a fate worse than death for some decks. In its final form, you are asked to pick your poison, and at the very least, one of your personnel with a lot of skills will be literally taking one for the team.